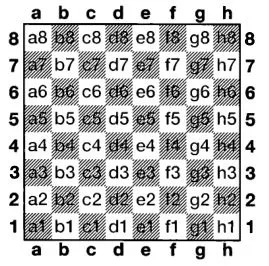 Did you know that every square in the chessboard has a name? How Many Squares in a Chessboard? 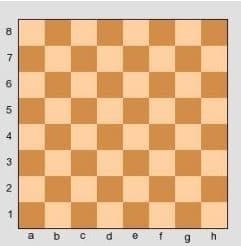 The chessboard has 64 squares (8 by side). How to locate them? Easy: each square has a different name. What’s the Name Of the Square? The name is: a letter followed by a number. The files – going up to board – are labeled a, b, c, d, e, f, g, h.
The ranks – going across the board – are labeled 1, 2, 3, 4, 5, 6, 7, 8 (starting from the White side of the board) (note: the White side is always on the bottom when it’s drawn). 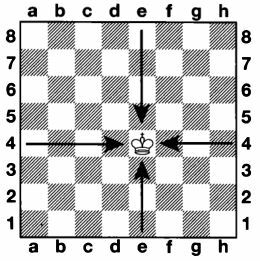 Let’s work out which square the White King is standing on in the image below. You might already be able to work it out by yourself. The arrows help to show that the king is standing on the e-file, and also on rank number 4. Therefore, the King is standing on the square e4. Now practice finding the name of the squares on the chessboard!